30 The Bond in Sydney is a sustainable commercial building that was the first CBD building in Australia to be accredited 5 stars under the Australian Building Greenhouse Rating. In May 2007, the building's official greenhouse result is over 20% better than the 5 star benchmark and about 30% better than the next best certified building in Sydney. The building is the global headquarters of Lend Lease. Australia’s first widespread application of passive chilled beam technology to assist in energy reduction. Cundall as pioneers of chilled beam technology in the UK, were engaged as mechanical peer reviewers to refine the design. Natural finishes such as bamboo, wool, sisal, goat hair, linen, cotton, and leather all contribute to the health of the environment. Child care centre on the ground floor. Open workspaces, pods projecting into the atrium for communal spaces and a chill/meet zone on the western perimeter. 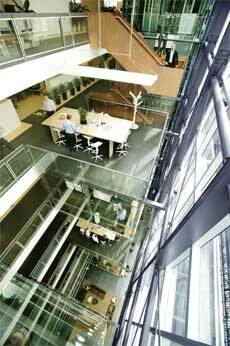 5 star energy rating with lower CO2 emissions than a typical office building. This has been achieved through the use of natural ventilation, passive chilled beam cooling and fully operable shading on the facades. Materials used reflect the local environment and maritime heritage with oxidised steel, recycled wharf timbers and patinated copper. This page was last modified 03:52, 27 July 2008. This page has been accessed 27,825 times.